Though the primary purpose of our building is to serve as a meeting place for our Fellowship, we make spaces available to community organizations and groups for uses compatible with our mission and vision, as well as for weddings and other events. See our Building Tour for a quick walk through of spaces. Below you'll find descriptions of each space and photos of setups for events. 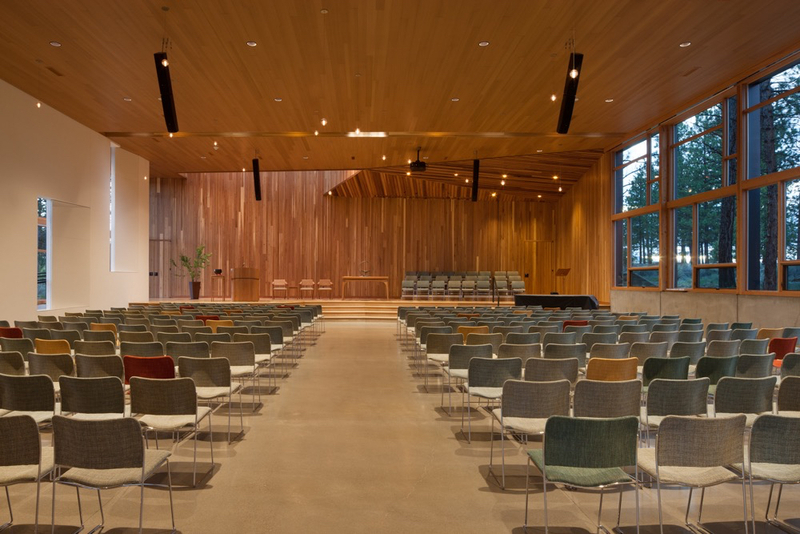 The central area of our building, it is open to the wide entry hall and connects with the sanctuary through 12-foot wide sliding doors, to the Linus Pauling Hall and The Founders’ Fireside Room through double doors, and to the kitchen through a pass-through. It is full of light and opens to the south terrace through wide sliding doors. Typically it has three large tables on wheels which can be moved as needed. The Gathering Hall is an excellent place for receptions, dining, conferences, meetings, and socializing. When additional space is needed, overflow can expand into the sanctuary, Fireside Room, or out to the terrace. Layouts for sample configurations available. Floor box within the Gathering Hall with audio and video capabilities. Speakers on outside terrace. 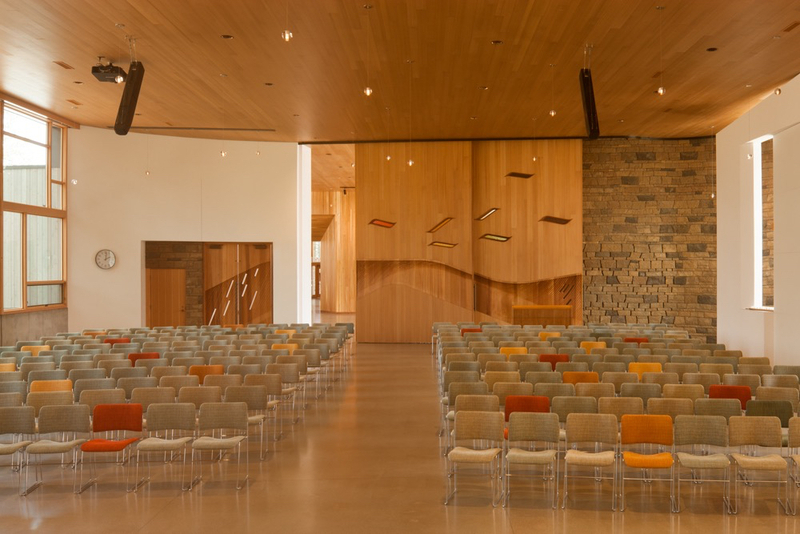 Designed to have excellent acoustics for speech and music, this is an adaptable space for worship services, ceremonies, lectures, concerts, meetings, and receptions. A mass wall on the south allows glimpses of trees while providing a means to mitigate temperature fluctuations and make energy use more efficient. Windows on the north wall look out to a grove of ponderosas. Twelve rows of chairs are typically arranged in slight curves with a center aisle, but are easily movable. The stage is 26-inches above the sanctuary floor and has connections in three areas for A/V needs. It is reached directly by steps, or an ADA ramp south of the mass wall. This is a versatile space located off the NW corner of the gathering space and is accessible through double doors, and connected to the kitchen. It is the only space in the building to have a view of mountains, and the only wood floor in the building besides the stage and backstage, so it is an excellent space for meditation and yoga. It looks west to the sacred grove and north into treetops. It is an ideal space for choir practice, workshops, conferences, classes, and film screenings. It has gallery hanging hardware and lighting for revolving art exhibits. For large events, buffets may be set up here with dining in the gathering hall. This space opens through double doors to the gathering hall, and a single door to the entry hall, but is quiet and private, if the doors are closed. It is a cozy space for discussions and small meetings. There is a table in an alcove that seats 8 comfortably, and a built in bench and ottomans around the fireplace. It houses our library for UU-related materials. Backstage, this area provides space for performers preparing to go on stage. It has a counter and mirrors, a unisex ADA bathroom, additional prep area, and storage, as well as the music director’s office and music storage. With high windows looking west into tree tops, this area can also be used for small meetings, classes, and break-out groups at conferences. Designed for both catering and cooking on site, the kitchen has commercial appliances. It is accessible through doors from the service corridor off the gathering space and outside, a door from the multipurpose room, and a large pass through from the gathering space. Commercial dishwasher, pot sinks, prep sink, prep island with 6 stools, plumbed coffee-makers, double refrigerator, freezer, bun rack. An island with gas range with 6 burners, griddle, and 2 convection ovens. Approximately 175 place settings. Near the front entrance and adjacent to the administration offices, this is a premium space for meetings, with a beautiful boat-shape conference table, comfortable chairs, video-conferencing capability, an LCD screen, and whiteboard. Windows are high and face west and north, looking into tree tops and ensuring privacy. LCD screen, phone, and power and data outlets in the table for presentations and video-conferencing, whiteboard. Microwave, refrigerator, sink, counter. Just off the entry hall, this space leads to childcare and RE classrooms. The children’s library is here, as well as a kitchenette for snacks, and a family restroom. This is a flexible space, suitable for overflow from other classrooms as needed or gatherings of all the children. A ping pong table doubles as a crafts and activities surface. This space is accessible from outside through the youth room. It is suitable for 12-step programs, a bride preparing for her wedding, and youth sleepovers. LCD screen, ping pong table. Microwave, refrigerator, sink, counter. Designed for middle and high school students, this youth room is off the RE Commons and has an outside entrance to the south. Adult-size furniture includes brightly colored Zuma Rockers, a comfortable built-in bench, and tables that push together to form a square. The childcare space is designed for babies through 4 years, and the Starr King Corner for ages 5-7. Spaces are bright and colorful and inspire creativity and fun. Each is a flexible space and has adjustable age-appropriate furniture, chalkboard paint walls, reading areas, and play areas. Cubbies and an ADA bathroom with small fixtures separate the spaces. All classrooms except childcare have outside doors with direct access to paths to the play area and future nature trails. Counters, sinks. Reading steps and rugs. SIZE: The childcare room for the smallest children is 526 sq ft. Starr King Corner is 664 sq ft .